During our stay in Danum Valley we went on two nighttime activities. The first was a game drive. The second was a walk and all of us carried flashlights and did our best to avoid leeches. I just don’t like the buggers. Unfortunately, both of the activities were a little bit of a bust. We saw some creatures, but not the big-ticket ones like the clouded leopard. But it wasn’t a complete bust. And I managed not to stumble upon any leeches. This entry was posted in Travel Stories and tagged 50 Year Project, Animals, Asia, Borneo, Danum Valley, Deer, Frogs, Jungles, Leeches, Life, Malaysia, Nature, Photography, Sabah, South East Asia, Toads, Travel, Travel Blog, Travel Journal, Travel Photo, Wildlife. Bookmark the permalink. Very cool pictures! Glad you avoided the leaches. ugh..
Me too! A few in our group weren’t so lucky. Frogs are just adorable. and leeches–don’t like them. No leeches = success in my book. Yes the creep me out. And you don’t know they are there since you can’t feel them from what I heard. They were everywhere in Danum Valley. One of our friends got one on her during lunch. I’m shocked that I didn’t get one at all. Is the leach doing a somersault? It’s attracted to body heat and it is moving closer to me to attach. If you run you hand over them they move try to get you. What animal is that – from my very non expert point of view it looks like a donkey crossed with a cow…enlighten me! My expert opinion isn’t all that fancy. It’s a deer. Pull it off. the guides said it was a myth that the teeth stayed attached if you pulled it off instead of burning it off. Luckily I didn’t have to find out if that was true. Love your photos, but I’m chicken, I would have been afraid of the leeches. I wasn’t fond of them either and I kept thinking I had them all over. The photo of the leech even though they are, well, gross, is beautiful! That’s a cute deer (we only have reddish ones where I live). And frogs are always cute. 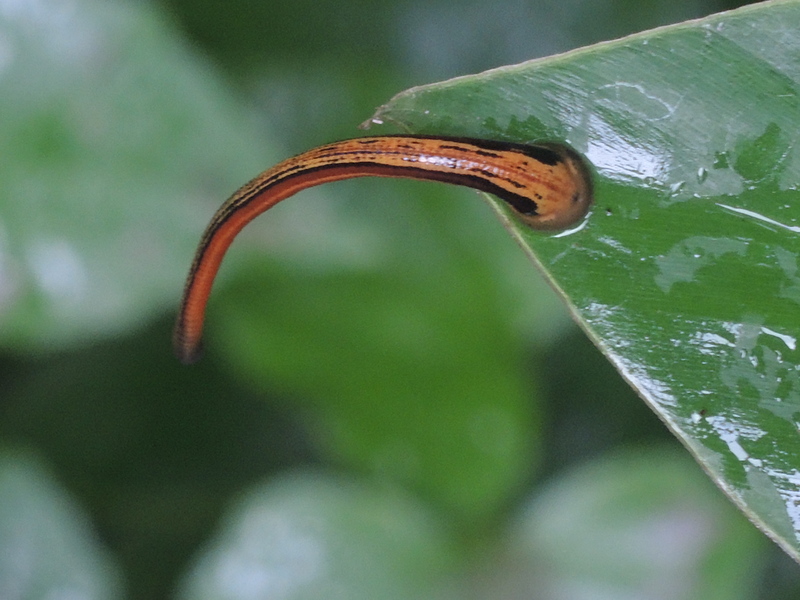 Leeches… less so, I agree! I’m sure leeches are important to the environment, but they gross me out. They are everywhere and I was told that I would be bitten. Dumb luck saved me I think. And the Better Half, who kept brushing them off my shoes and trousers for me. OMG leeches. Okay, I’m staying at home then! I feel itchy and twitchy all over now not to mention eugh! I was itchy the entire time I was there and hyper-vigilant. Beautiful pictures, TBM! I am just reading a Nic Bishop book on frogs and they are so fascinating! It was nice to see them in your photos. I bet the book is fascinating. Frogs are amazing creatures. I try not to hate living things, but it’s hard when it comes to leeches. Yikes…leaches!! The thought of them makes my skin crawl!